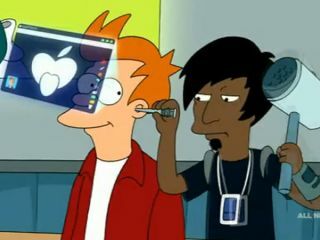 One of my favorite Futurama episodes was about Fry getting an EyePhone (get it?) that allowed him to walk around watching the Internet on a screen projected into the air in front of him. Surprisingly enough, this technology could really happen. Sort of. Instead of being hilariously and painfully jammed into our eye sockets, we can just slip on a pair of contact lenses with LEDs printed onto their surface. Scientists at the University of Washington are working on embedding miniaturized blue, green, and red lights onto the surface of contact lenses. Once that happens, they'll be able to connect the lenses to another video source like a computer or mobile phone, and you'll be able to look through the lenses instead of the screen. This will allow you to watch video anywhere. Imagine being able to watch TV or movies while you're at a business meeting. Or overlay an augmented reality template that makes everything look like the bridge of the starship Enterprise or Pandora from Avatar. Reality, your services are no longer required. I don't know enough about vision to argue with them, but at the same time I find it hard to believe all these scientists are working on projects that absolutely will never work.So I'm pre-ordering my EyePhone right now, just in case. That's great.. Would love to see this innovation in work. I'm glad to see that LED lights is becoming more available and more affordable. And I have brought some from http://www.ledlightshub.com.